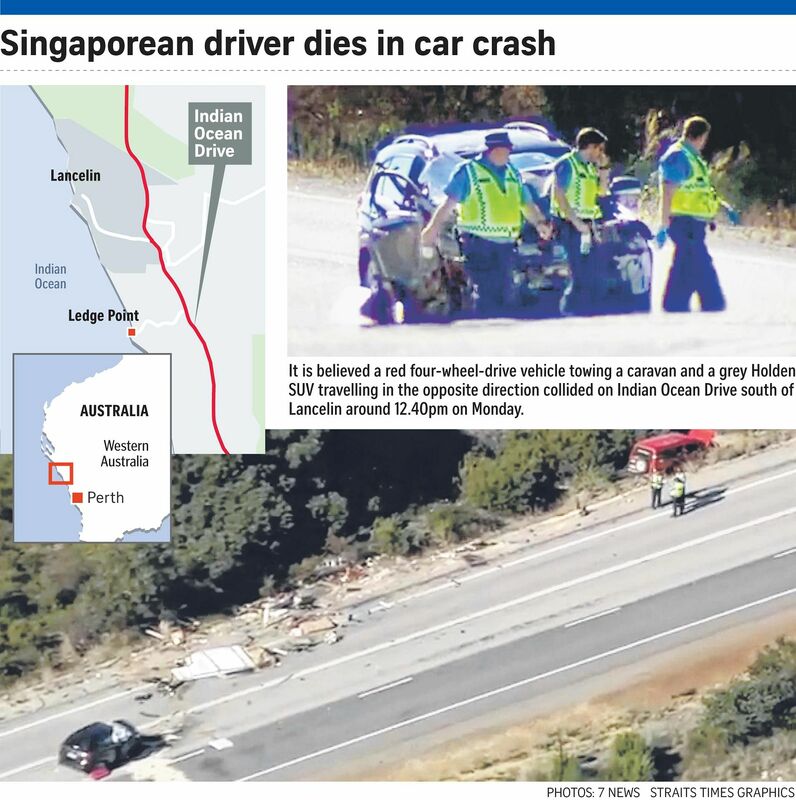 A 40-year-old Singaporean, who was driving along an accident-prone road in Australia with his family, died when his car crashed into another vehicle near Perth on Monday. The man has been identified as business analyst Y.L. Tan, a Western Australian police spokesman said yesterday. Mr Tan is believed to be an employee of the Bank of Singapore. His wife, Madam L.Y. Ngan, 40, and their two young children, who were also in the car, escaped with minor injuries and were taken to Joondalup Health Campus. Madam Ngan was later transferred to Royal Perth Hospital and discharged yesterday, a hospital spokesman told The Straits Times. ST understands that she suffered an injury to her collarbone. The children were transferred to Princess Margaret Hospital For Children, and ST understands they are not injured but are being kept there for observation. The Australian police spokesman said the family was visiting Perth and travelling in a sports utility vehicle when the accident took place at 12.45pm on Monday along Indian Ocean Drive, a tourist road which opened in 2010. Their vehicle collided with a four-wheel-drive vehicle towing a camper trailer that was headed in the opposite direction. The 64-year-old female driver, an Australian, suffered minor injuries and was taken to hospital, the statement added. Singapore's Ministry of Foreign Affairs earlier said the Singapore High Commission in Canberra had sent a consular officer to Perth to provide assistance to the family. The Australian state's Road Safety Commissioner, Mr Kim Papalia, told ST yesterday the authorities were considering measures to make Indian Ocean Drive safer for international drivers, including installing more roadside rest areas. In April, a Malaysian driver was charged following a crash on the road that left seven people injured. Mr Papalia said the stretch has had four deaths and 77 injuries between 2012 and 2016, and an audit of the road would be scheduled either this year or next. "The Road Safety Commission will look to conduct a safety audit of Indian Ocean Drive, to identify any aspects of the road that present a high risk to drivers and work on possible solutions to those risks," he said. He told ABC News that the state's roads posed risks for international drivers. "The risk in WA (Western Australia) is our unique sort of roads, the long distances you travel between towns, the opportunity and awareness about road use in this state," he said. "It can come down to simple things like driving on the left side of the road and the speeds that we travel at." A state MP for the area, Mr Shane Love, told Australian media that the road was not designed for the amount of traffic it now accommodates, particularly on holidays. Monday's crash happened on a public holiday in Western Australia. Figures provided by Western Australia's roads agency showed that daily traffic on the road increased by more than 30 per cent between 2010 and 2014. Mr Papalia told ST that traffic increased on long weekends and during holiday periods, particularly with drivers who may not be familiar with the conditions of the road. Singaporeans have been involved in accidents in Australia before. In May last year, two women were critically hurt after the car that a group of five Singaporeans was travelling in collided with another vehicle in Laharum, Victoria. The driver, National University of Singapore graduate Andy Ng, 24, was jailed for two years in Australia for dangerous driving.